After the storm-low series in early March another storm low series came directly after the first. This consisted of five winterstorms which moved successively from March 10 to March 17 over Europe and Germany. Winterstorm EBERHARD was the first one with gusts up to 166 kph, followed by FRANZ (126 kph) and GEBAHRD II (130 kph). The sstorms HEINZ and IGOR formed the conclusion of the storm series. But not only destructive winds brought by the storms, but also severe precipitation, as deep GEBHARD with 100 mm in 24 hours in the Black Forest. Also in mid-March the storm series did not stop. Just on March 7 Orkantief CORNELIUS left Europe. On the 10th of March, the wintestorm EBERHARD followed. Affected by the strong winds were mainly Britain and Germany, and France. Already on the 12th and 13th of March FRANZ II followed. The post-frontal weather was especially impressive because of strong showers and thunderstorms. One of the storms even produced a F3 tornado in NRW. Only a day later, storm GEBHARD II reached Europe and Germany. Also on March 15, the storms did not stop because storm HEINZ reached Europe. At the bottom, on March 17 and 18, was the storm IGOR. After these 5 rotogravure systems, the weather calmed down and the powerful high-pressure zone HANNELORE brought a wind-weak and sunny, relatively dry weather section. As early as March 9, EBERHARD was identified as a wave disruption across the Atlantic in the zonal flow. By the evening its core pressure dropped to 1005 hPa. With this pressure, it reached the north of the UK on the night of March 10, then Ireland. 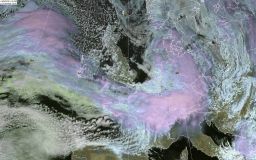 During the day it moved quickly southwest and reached with a core pressure of 998 hPa Germany. In the evening it left Germany heading to Eastern Europe and intensified further and its core pressure reached a minimum value of 994 hPa. This also caused storms and gale gusts in Poland. Reason for the further intensification was the favorable situation at the right jet exit. On Monday and Tuesday the 11th and 12th of March, there was a brief weather calming by High GABI. But at that time a second storm low formed on the North Atlantic in Ireland already. FRANZ was already recognizable on March 10 as a wave disruption over the Western Atlantic, but quickly shifted to Iceland and intensified rapidly. Both on the geopotential maps, as well as on the 850hPa temperature maps FRANZ can be seen as a pronounced wave disturbance. From 11 March to 12 March, its pressure dropped from 990 hPa to 955 hPa, around 45 hPa. FRANZ underwent an explosive cyclogenesis due to the high positive divergence values at the right jet exit and a dry intrusion. The pressure gradient to 100km was 20 hPa (35 hPa to 300 km). 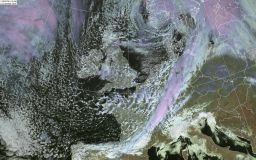 Its core reached the north of the UK on the night of March 13 it formed the fringing low FRANZ I. The FRANZ II core pressure had risen to 965 hPa and the pressure gradient had fanned somewhat, but remained close to the center at 20 hPa 100 km. 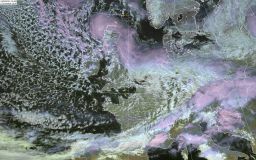 Due to the weakening jet stream, the pressure increased further on the way to the southwest over the North Sea. 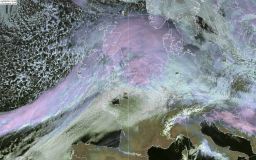 At noon, the core passed through Denmark at a pressure of 990 hPa and reached the North Sea and the Finnish Baltic Sea coasts until evening. On the front there was strong warm air advection whereby in Germany on the 12th of March the temperatures rose to 14.1 � C (Freiburg, BW). On the back, on the other hand, there was strong cold air advection at altitude, which made the air mass very unstable. The result was heavy showers and thunderstorms the following day. Meanwhile, low GEBHARD was already at Iceland, which on 14 March, a small edge low GEBHARD II spawned. 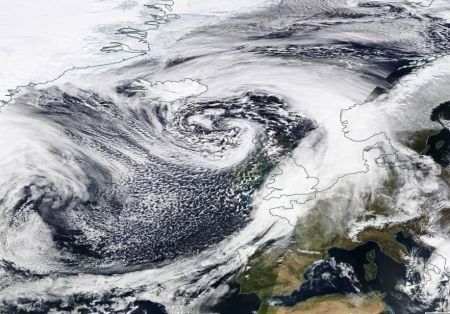 With a core pressure of 985 hPa, it passed the northeast of Britain and crossed the North Sea to the southwest on the same day. With a slight increase in core pressure to 990 hPa, GEBHARD II's center crossed northeastern Germany and then rapidly headed northeast. At the same time (14-15 March), a small wave disturbance had developed over the western Atlantic. This formed over to the evening of March 14 to storm HEINZ and met with 990 hPa in the night of March 15 in the north of the UK. It also quickly crossed the North Sea and crossed the north of Germany and Denmark until the evening. HEINZ moved on to Eastern Europe via the Baltic Sea. HEINZ also had a strong warm air advection on the frontside, which caused temperatures in Germany to rise to 14.8 � C (Andernach). Low IGOR, which was the last winterstorm of the storm series, had formed as a wave disruption also on the Atlantic in the zonal flow amidst a strong jet stream. He quickly moved east and hit the shores of Ireland at 983 hPa on the morning of March 16, and hit Scotland's shores a short time later. Due to its favorable position in the jet stream, its pressure dropped to 967 hPa by the morning of 18 March. Above all, its cold front was pronounced and characterized by a long cloud band. 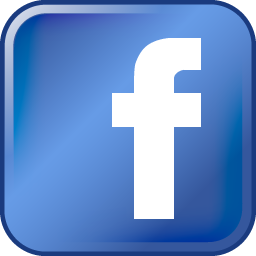 Its center did not reach Germany and Central Europe. 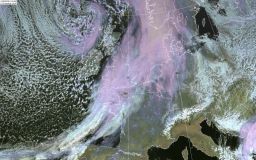 The strong gusts were mainly caused by that cold front and reached the west of Germany in the night of Sunday. During the course of the day, it moved southeast and caused especially in the low mountain ranges and the Alps edge for accumulated precipitation. Winterstorm EBERHARD had a firm grip on Germany on 10 March. His storm field attacked from the morning of the northwest on Germany and reached its maximum at 16:00 clock. Gusts up to 166 kph swept over exposed areas such as the Feldberg in the Black Forest. But even in the lowlands heavy storm gusts were around 100 km / h here. Damage were caused by such wind speeds. In the neighboring countries of Germany, gale gusts beyond the 150 kph were also generated, as on the Dutch offshore platform K13 A with 194 kph (source: ogimet.com), which corresponds to a categorie 3 hurricane . Whether the destructive winds are a so-called Sting Jet or 'just' the winds of the Cold Jet can not yet be said. There were cloud stripes near the core which can be a sign for a sting jet. Although the north and northeast of Germany showed little wind, it did get some precipitation in the form of rain or snow. Especially in the low mountain ranges, the air masses jammed due to the pronounced west weather situation and led to accumulated precipitation. In Freudenstadt in the Black Forest 40.4 mm came together in 24 hours, on Brocken in Hartz 27.6 mm were recorded. The temperatures were also unusual. Due to the strong warm air advection, the temperatures in southwestern Germany rose to a very mild 16�C such as. in Frankfurt and Mannheim or Lahr. All five winterstorms had gusts over 120 kph. EBERHARD generated the strongest winds with 194 kph (NE), followed by FRANZ (178 kph GB) and GEBHARD II (130 kph, Brocken DE). Due to the high wind speeds numerous trees were uprooted and branches were broken off. In addition, the rainfall softened the soils, which gave the trees or roots less grip and thus increased the risk of falling trees even further. These crashed on houses, cars, as well as roads and rails. This resulted in significant traffic disruptions, both in road and rail traffic. In some cases, air traffic was also restricted due to the strong gusts, which also led to delays. In North Rhine-Westphalia, the Deutsche Bahn partially stopped train traffic because of Twinterstorm EBERHARD.